The origin story was altered for Batman’s Dark Night Trilogy, and it has been done even better for Superman with Man Of Steel. Foregoing the previous Superman films story, starring the late Christopher Reeve, Man Of Steel takes an alternative approach, beginning on Superman’s home planet of Krypton and then moving into the present life of Superman as he moves as a ghost in order to hide his true identity. Yes, if you’re looking for the bumbling newspaper reporter with starry eyes for his fiery colleague Lois Lane, Man Of Steel is not your movie. If you’re game for a new twist on the Superman origin story, and a more modern and feminist approach to Lois Lane, Man Of Steel is for you. Beginning on Krypton, audiences are treated to the entire story of how the planet collapsed, General Zod’s rebellion against the government, Kal-El’s birth (Superman), and him subsequently being sent to Earth by his parents Jor-El (Russell Crowe) and Lara Lor-Van (Ayelet Zurer). A great amount of detail goes into telling the story of Krypton and Superman’s birth–especially in terms of genetics and the survival of an alien race. These two items will be incredibly important once General Zod and his army reach Earth searching for Kal-El; to reveal how so would be to spoil much of the story, and therefore it will not be included here. What happens to Krypton is not a spoiler, the planet is destroyed and Kal-El is sent in a pod to Earth in order to keep his race alive and with the hope that he may make it possible for others like him to live again. The bridging of two races, of acceptance and melding of cultures, is a big part of the larger Man Of Steel story–hopefully to be expanded upon in the inevitable sequels. Kal-El’s arrival on Earth does not begin his story. Instead, screenwriter David S. Goyer jumps into the present day life of Kal-El, known on Earth as Clark Kent. He knows he is different, and that he comes from another planet, being discovered by Jonathan (Kevin Costner) and Martha (Diane Lane) Kent in Smallville, Kansas as a baby in his Krypton-built craft. But Clark does not know the entire story, and that will all change when an alien craft is discovered in the arctic region of Canada. This is also the moment where Clark meets Lois Lane (Amy Adams) for the first time. Her investigative reporting skills are about to make his secret life difficult, and dangerous, when she hones in on discovering his true identity. She of course will get herself into trouble at The Daily Planet newspaper, and find herself in the middle of the fight between Superman (as he is named in the movie by the people of Earth) and General Zod’s army. Lois is always causing some sort of trouble, luckily for viewers of Man Of Steel she makes it very entertaining to watch, and even comical at times. Man Of Steel‘s narrative combines Clark’s search for his true identity, him reconciling how he was raised by the Kent’s–with the use of perfectly staged flashback sequences that detail what its like to grow up different–his relationship with Lois, and the inevitable battle with General Zod’s army. When Clark had to hold back punching a bully as a kid it was not because it is wrong, necessarily, but because one punch from him can be deadly. You also get to see his feats of strength and heroism as a kid, and an adult, and how with each one he was forced to be more reclusive; to hide his true identity because as his Earth-father warned, the World is not ready to know the truth. Man Of Steel adds a greater amount of depth to the Superman story with the strong emphasis on difference in society while also managing to keep things light when it comes to his relationship with Lois. The action portion is provided by the fight with General Zod (Michael Shannon). It would have been nice to see more from Shannon for his General Zod character; much of it is staged with brief sequences that do not emphasize much about the ferocity of Zod. His minion army does most of the work when it comes to causing havoc to Earth and humans. He still makes for an entertaining antagonist, and even his motivations, while supposedly wrong, do provide for some sympathy from the viewer. They also call into question a great deal about genetic research, ebonics, and mutation–but that you have to confer for yourself when watching the movie. 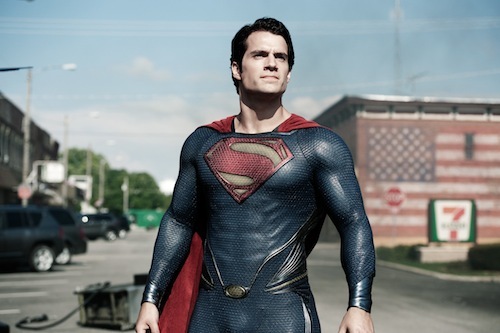 Now, one of the key elements to the success of Man Of Steel is the man himself. Clark Kent, Kal-El, Superman, whichever name you want to call him, Henry Cavill’s turn as the man in the blue and red suit, with his red cape swirling in the wind, is without a doubt the sexiest incarnation of the character yet to be seen. Cavill is chiseled perfection, even when sporting a gruff and unkept beard. One scene finds him on a burning oil rig, his clothes having been burned off his torso, and behold, the striking silhouette of his body is revealed. You should prepare yourself to be enamored by Cavill’s beauty throughout the film, to the point of almost distraction. Its not a bad thing, and it will undoubtedly sell you on him being Superman because a man who looks this good cannot be human. Cavill’s Superman does not say much, and he does not need to. Its all in the presence he evokes from the screen, and Cavill nails it. Man Of Steel is not the Superman story of your youth, or the one the current generation saw with Superman Returns. This is thankful praise, and anyone who ventures out to see the red cape in action will surely welcome the beginning of a new chapter for Superman. If you’re dismayed by Lex Luther not being present in the movie, do not lose hope. A truck can be seen for Luther Enterprises in one of the New York City shots so he is coming, you just have to be patient. One of the largest gripes about the 2006 Superman reboot, Superman Returns, was the lack of action. A very trusted source made me aware of the fact that Superman never throws a punch during the entire film. Director Zach Snyder, and screenwriter David S. Goyer (The Dark Knight trilogy), obviously took note as Man Of Steel is packed full of action. So much so that many might argue it sacrifices story in order to display the fantastical feats and special effects mayhem of a summer superhero blockbuster. The aforementioned is not a bad thing, in my opinion, as Man Of Steel boasts enough story to enable long drawn-out scenes full of explosions, metallic fighting tentacles, hand-to-hand fighting, and pulse-pumping excitement. Superman does not need to be a quiet fighter, and Man Of Steel proves this fact time and again. The special effects lend the greatest strength to the action in Man Of Steel. From the beginning of the film, where we watch Krypton meet its doom, to the final climactic battle between Superman and General Zod, the effects created make each scene larger than life and full of imaginative creations. The consistent use of the sonic boom sound will actually emit chuckles; we get it, he breaks the sound barrier. There are very similar scenes to other superhero movies, namely the Main Street battle in Thor, where here Smallville gets blown to hell, thanks to a very large minion of General Zod’s army. The stand-out action fighter award for Zod’s army goes to Faora-Ul (Antje Traue). All thoughts that she is a woman and should not be harmed are quickly admonished once you witness the evil that lurks beneath her exterior, and the way in which she relishes in her lack of morality enabling her to harm without conscience. And harm she does, to anyone and anything that comes her way–and she enjoys it. A shocking discovery occurs during the climax of the movie. New York City is being destroyed by Zod’s machine and his army. It is a frightening and exhilarating scenario. Then one thing happens and suddenly you realize the post-9/11 trauma that has been avoided in movies since the events of 9/11 has come to an end. 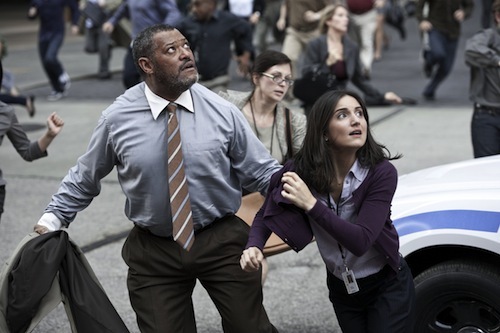 Flying crafts collide into buildings, smoke fills the air, and then, without warning, the Daily Planet staff, led by Laurence Fishburne’s Perry White, are about to get toppled by a building crashing to the ground. Its all very surreal, watching this moment occur with the memories of 9/11 flooding your mind at the same time. Those who did not witness that horrific morning, through real-life on the ground memories or watching it on the news, will undoubtedly not have the same reaction when watching this scene in the film. For those of us who do remember, it will strike a completely different chord inside of you. The fact that this was allowed to be shot, edited, and presented this way is actually a positive occurrence. It shows that we are healing, unafraid to accept the tragedy that has befallen our Country, and we can move past it. There is no need to shelter people from the truth, or to censor artistic creation. Man Of Steel says a great deal about society, culture, and war that it is only fitting it uses a scene so similar to one of real events that changed our world completely. Man Of Steel breathes new life into an old franchise, and it does it by packing itself full of action while maintaining a strong story base. It has the thrills and panache of a great action film, with the added bonus of a man in a suit with otherworldly powers; a winning combination.